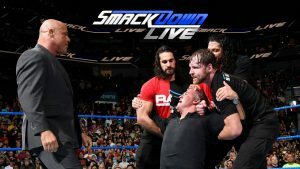 A night of unsurprising yet fairly entertaining surprises culminated in an expected brawl before Survivor Series. 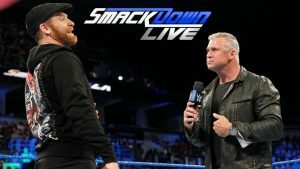 One night after putting RAW under siege, Shane McMahon returns to SmackDown and, along with Daniel Bryan, begins to build his teams for Survivor Series. 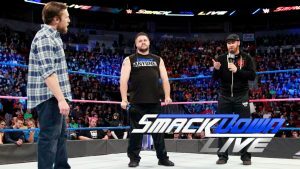 Sami Zayn and Kevin Owens team up to face a duo of Daniel Bryan’s choosing in an okay, but rather forgettable, episode of SmackDown Live. 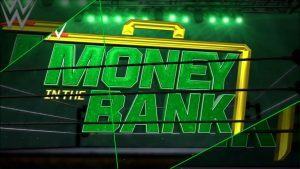 Fallout from Hell in a Cell takes precedence on an alright, but no great, episode of SmackDown Live. 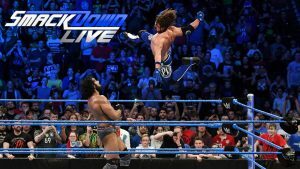 With a couple of non-title matches and a lot of talking, this week’s SmackDown was pretty good, but not as good as last week. 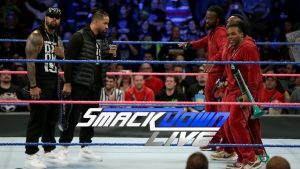 AJ Styles battles Chad Gable to determine who will enter an Independence Day battle royal, The Usos face New Day in a surprisingly entertaining rap battle, Lana gets another title shot, and John Cena returns on a good episode of SmackDown Live! 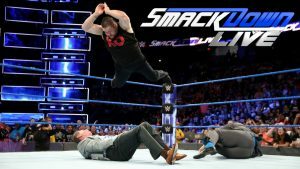 Daniel Bryan makes a decision about the “controversial” women’s Money in the Bank match, Kevin Owens issues and open challenge, Dolph Ziggler takes on Shinsuke Nakamura, and more take place on this pretty good (sometimes very good) episode of SmackDown Live. 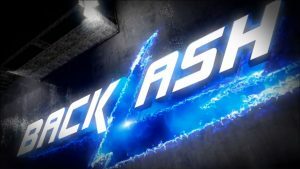 The Backlash 2017 Kickoff show was an average opener, featuring Aiden English versus Tye DIllinger. 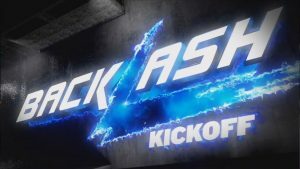 A big six-man tag match highlights a pretty good episode of SmackDown that also featured a special London edition of “Fashion Files” and a great promo from The Usos. On his first night as a member of SmackDown, Jericho must defend his US Title in a rematch against Kevin Owens.